Another attempt at a COLLADA parsing and rendering library. A rewrite of the RCBC one included in TX but written in C++ rather than C, and using Xerces-C++ rather than MiniXML. Using shader based OpenGL 3.2+ core profile rather than the fixed function pipeline. 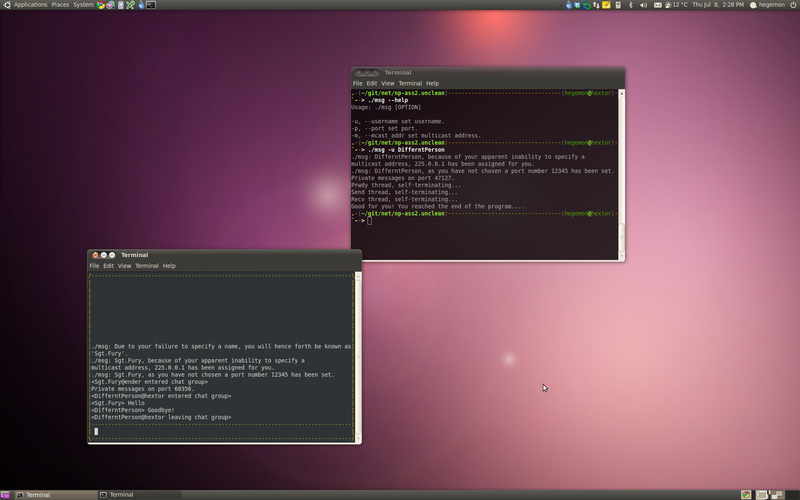 GLM used for matrix operations. Source. Screenshot 1, Screenshot 2. Status: Under development. Lighting positions need to be updated for rotated mesh, material texturing need to be correctly linked to shaders. No animation, physics, embedded shaders or other more advanced COLLADA features. 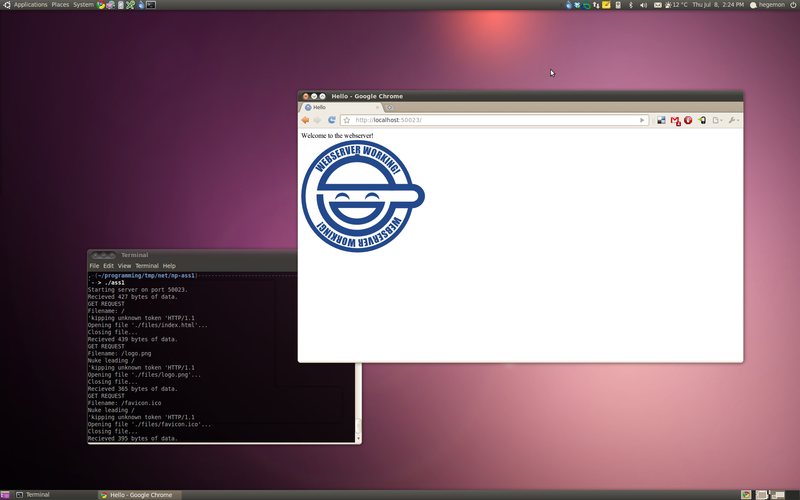 Uses Webkit and GTK to render a HTML page on the Linux desktop (including full alpha transparency). In future looking at writing a WebSockets server to allow for computer statistics (temperature, fan speed, memory usage, etc...) to be displayed. Source. Screenshot. Status: Hiatus. 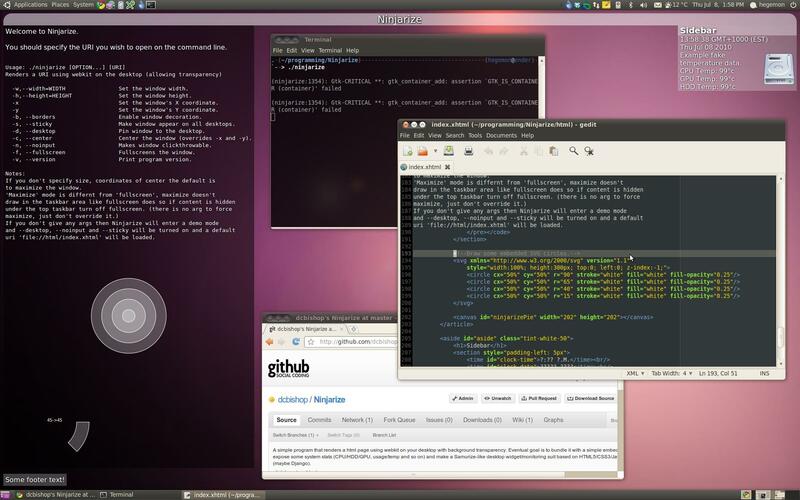 Basic html display was fully functional, however local content loaded via file:// urls such as used in the demo no longer work as of Ubuntu 11.04. 2 example socket.h programs from old uni assignemnts. A UDP multicast chat server with a ncurses interface. Source. Screenshot. A simple webserver with 4 branches with different methods of threading (none, fork(...), pthread(...), select(...)). Screenshot. Status: Finished. Should work. No IPv6 support. 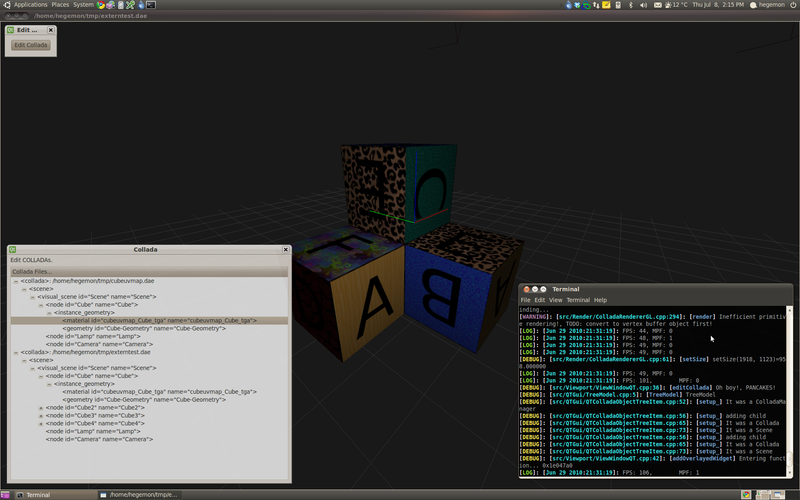 A simple XMPP server written in C++. Uses Boost. Intended to be a flexible chat backend for a game engine but could be used for anything. IPv6 support. Status: Under development. Allows for a client connection from Pidgin/Empathy and will pass a message between clients. Clients see all other clients. Source and other projects can be found on my github page.